The spotted coat of the Bengal Cat has generated a great deal of interest in this relatively new breed, even though its numbers are still small. The breed has inherited its distinct markings from its female ancestor, a wild Asian Leopard Cat that was mated with a domestic Shorthair - one of the female litter went on to mate with her father producing a litter of spotted kittens. Bengals still show behaviour traits common to the wildcat, particularly in their fascination with running water. 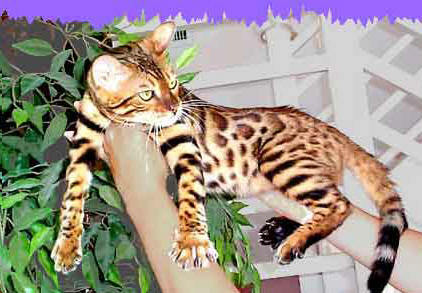 The Bengal Cat originated in the USA in the early 1960's and was recognized as a new breed in 1983. More recently, it has been imported to Britain, although its numbers are small it has still gained championship status. Bengals do reveal traces of their wild origins in some of their character traits. they can be restless, lively and curious. They particularly love the thrill of the chase and the hunt. Bengals are a large breed, it is friendly , loving, alert, curious and intelligent. The Bengal has little fear of other cats, or any other animal and makes a charming pet. The large spots on the coat line up in horizontal rows, giving the coat a distinct appearance. Mink is a term used in the USA to describe some varieties of Snow Bengal. Sorrel is also a colour variation and refers to light orange brown coats. Sorrels are not registered as a separate variety in the UK. The Snow and the Silver are two separate cats, the Silver is not a true colour, it is caused by the inhibitor gene. Nearly all species of small, wild cats can cross breed with domestic cats to produce hybrids. One of the Bengal's ancestors was a feral cat that caught rats in the Rhinoceros pen of a Zoo in Delhi, India. These kind of cats were once known as Leopardettes. The Leopard was the first Bengal variety, although the name 'Leopard' has now been dropped. There are two others, the Sorrel and the Mink. A Bengal kitten's fur is relatively coarse, and becomes silky with maturity. Bengal Kittens can be expensive and can fetch up to and over one thousand pounds (£1000).